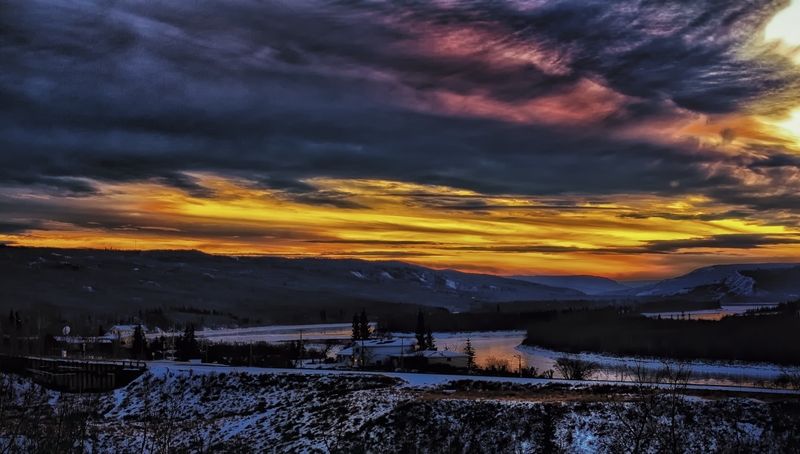 For a second time, a Peace River, Alberta sunset arrests my attention. This photo is an image exposed incorrectly, but one that has been shot as a RAW file; editing is able to rescue the image returning it to Life and intention – a sunset shot. Earlier this fall on a day when we (my family and me) had been to Peace River for a day’s outing, the day’s return journey began at sunset; we in our vehicle making the long five kilometre climb westward out of the Peace valley and enjoying an array, scatter and stir of cloud work – hues deepening, then diminishing. A sight to have caught as a photo, this sunset … but just as easily enjoyed by each of us for what it was; there will be other sunsets (we do live in Alberta). As an entity, the immediate follow-up to sunset is dusk, light that softens as it leaves, light that colours as it diminishes – in photographic terms it de-saturates (withdraws colour). As an entity, dusk is intermediary between the stark, factual reality of daylight and that part of Life that occurs in the unseen. As an entity, dusk seems to be a visual reminder of transience – at sunrise dusk is a part of how we enter the day; at sunset dusk moves us from our day into night. The day’s movement is a part of our forward Life movement reminding us of our impermanence. A promise to hold on to … right?